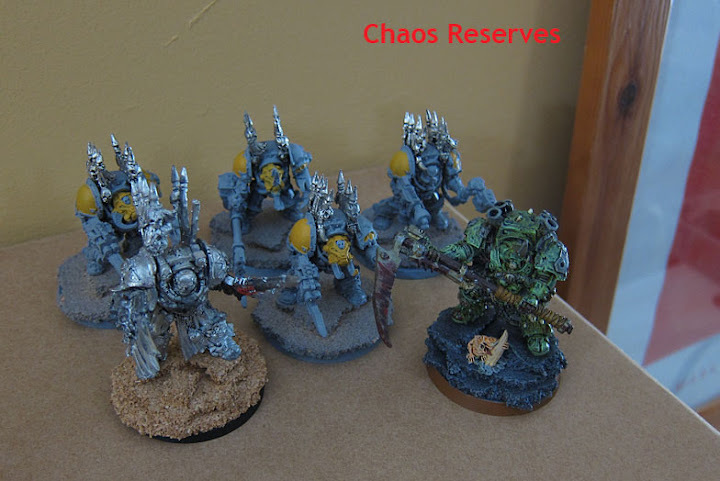 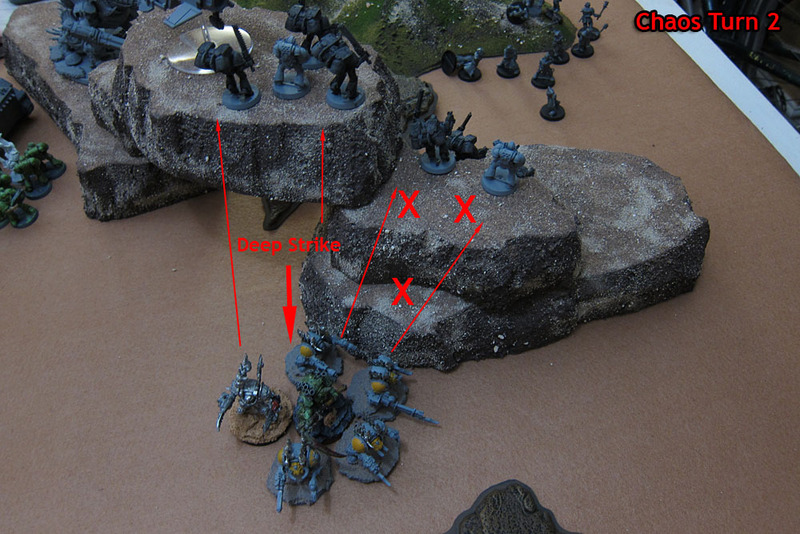 Blood Spectres v Chaos Space Marines – 2013 part 2! 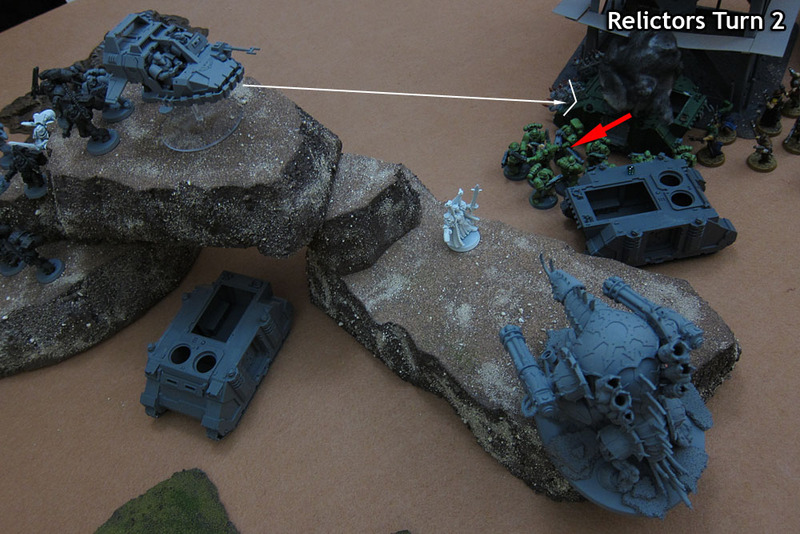 I spy, with my glowing green eye, a tasty Chaos relic! 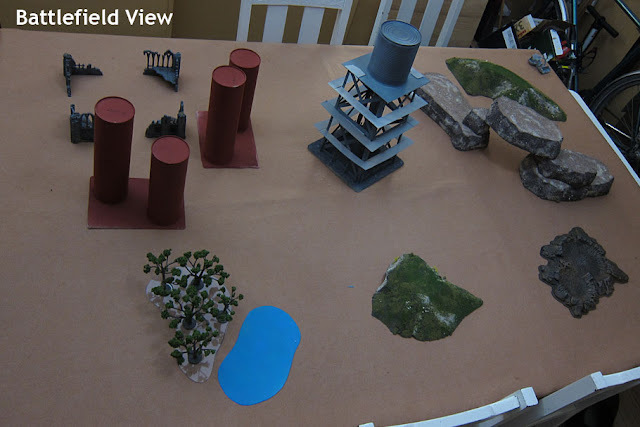 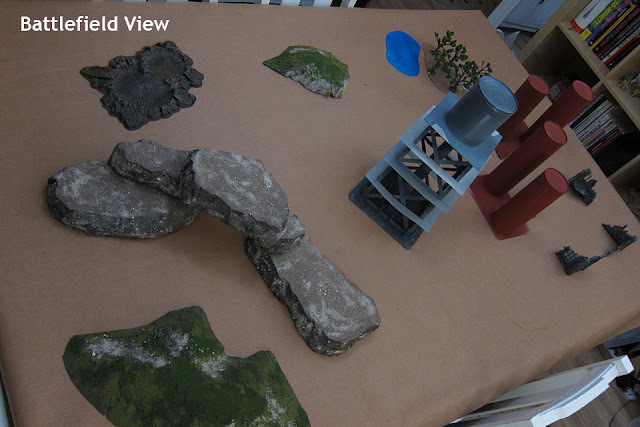 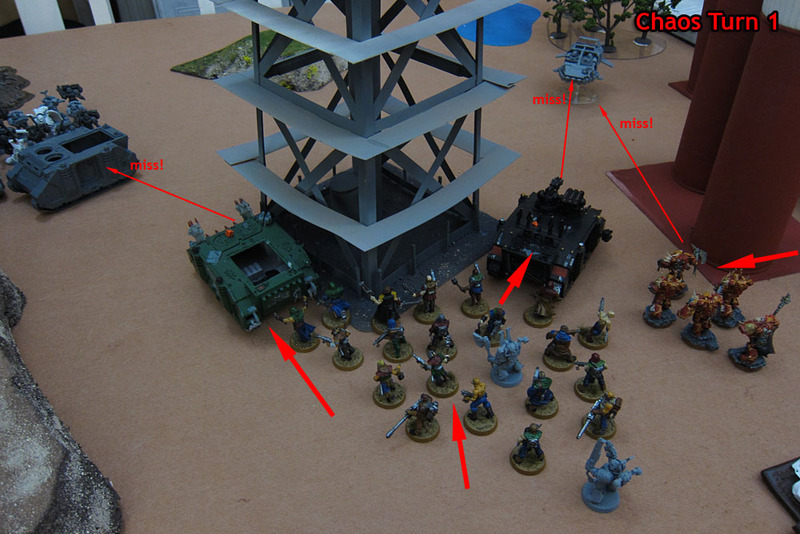 I also spy a renegade battle force across the field, also vying for a taste of that wonderful Chaos goodness! 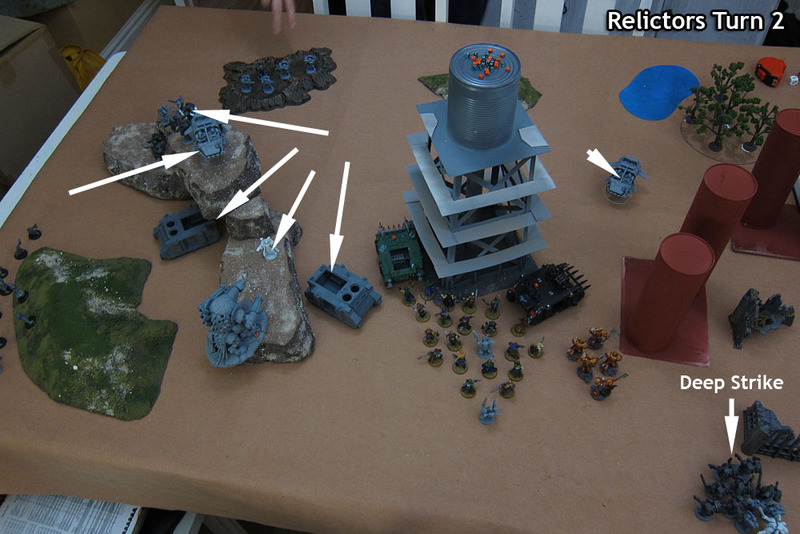 Who shall the win the fight this day? 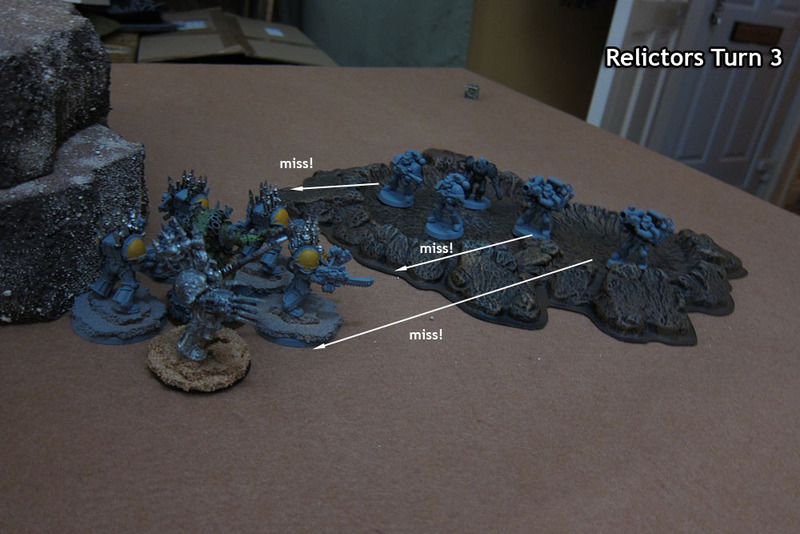 Chaos didn’t steal the initiative, so Relictors started off! 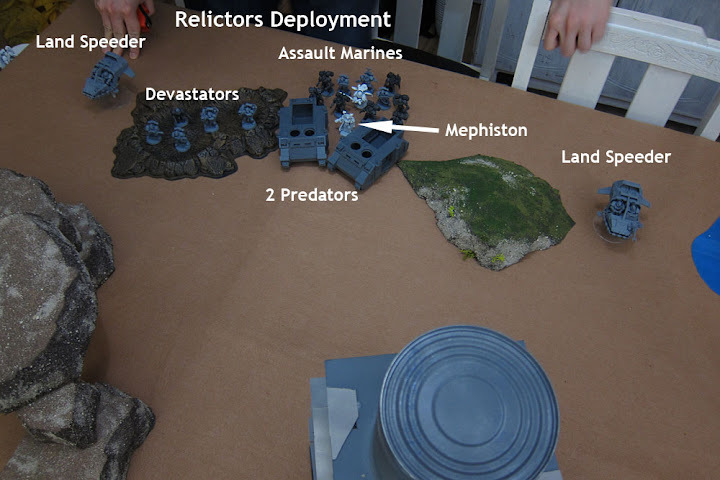 Devastators stayed where they where, while everything else moved up. 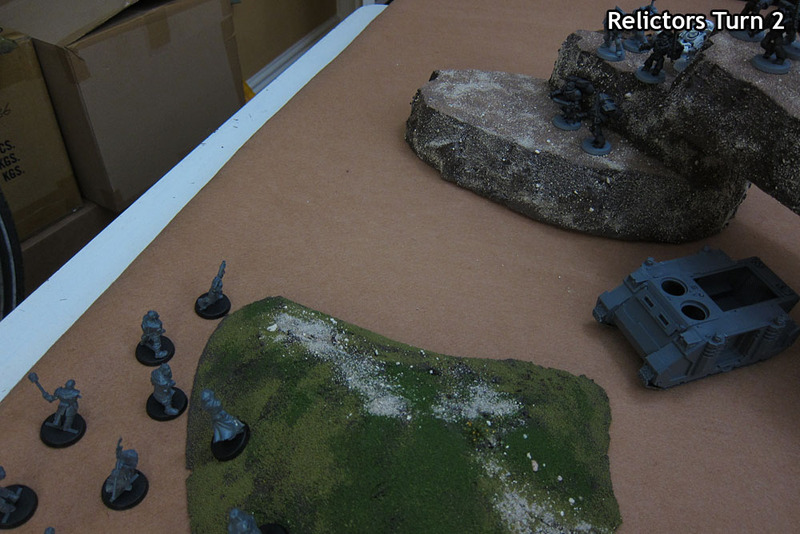 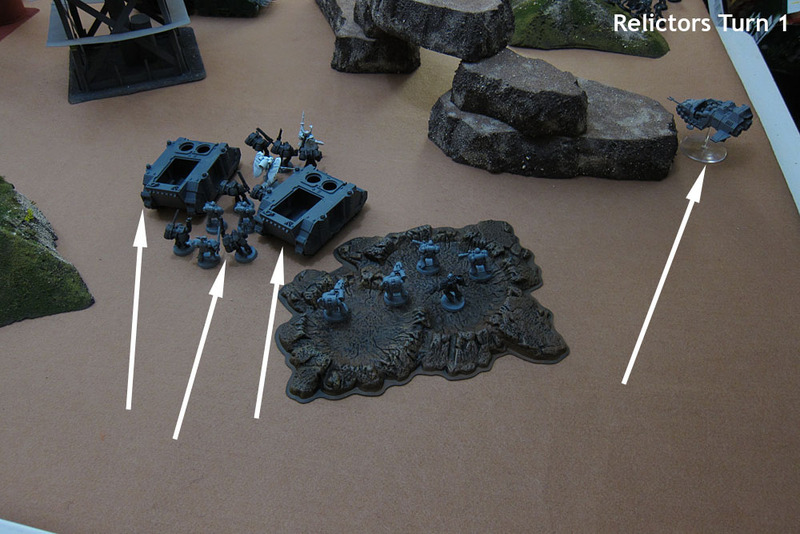 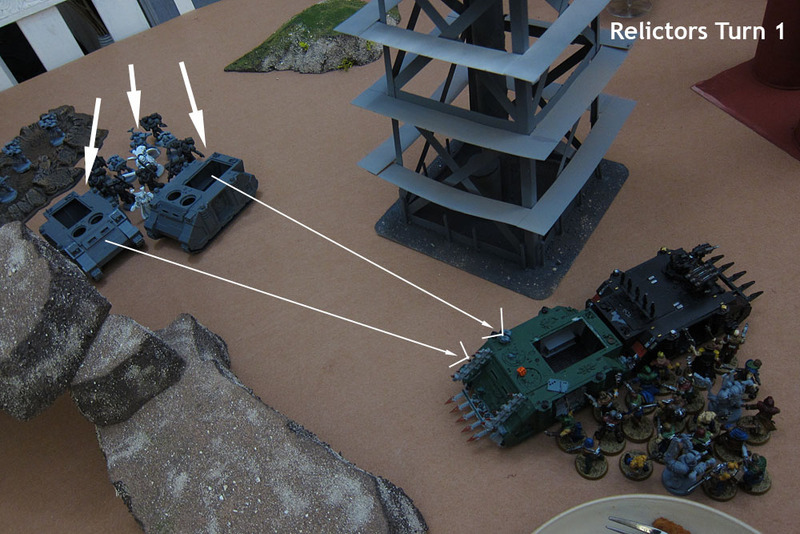 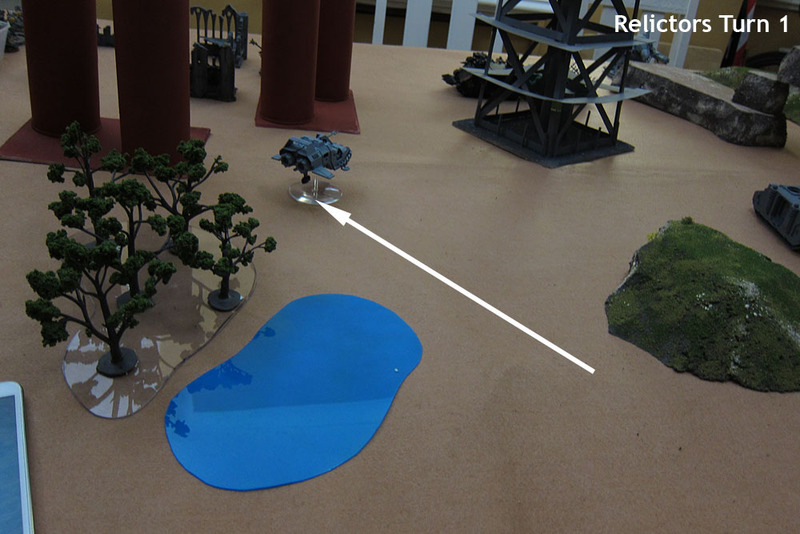 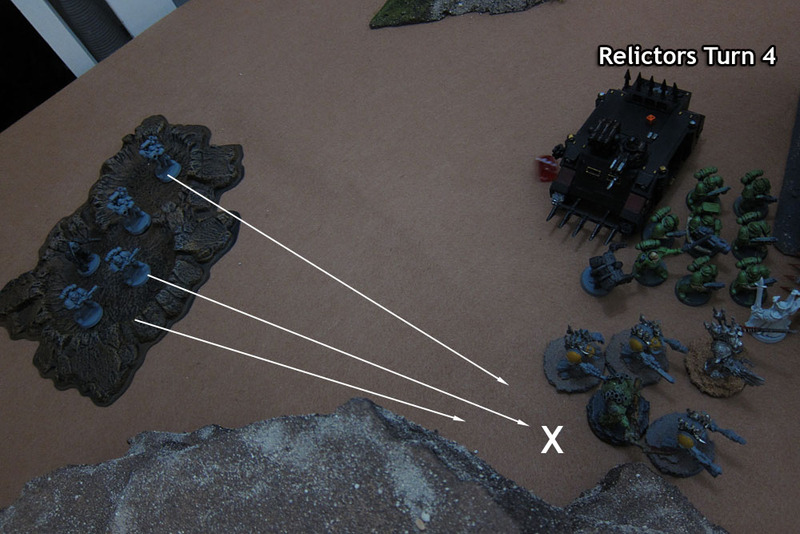 One Predator fires everything at one of the zombie units, but doesn’t do very well – still took out a couple! 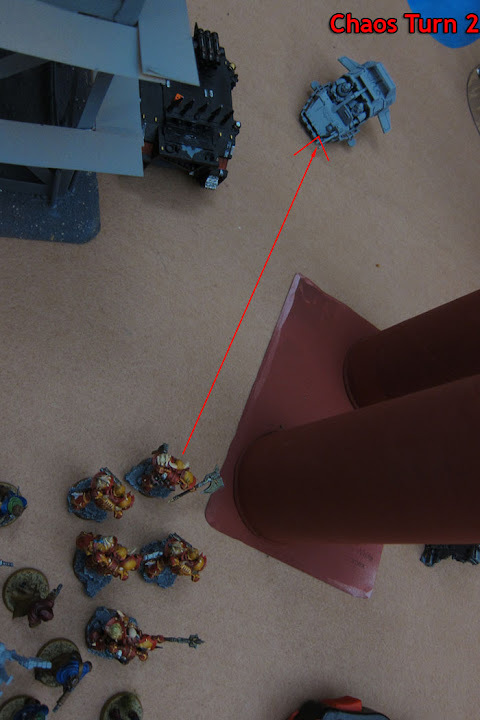 The jump Assault Marines land on the archway and pop a few shots at the Plague Zombies, and this Predator misses most of its firing also. 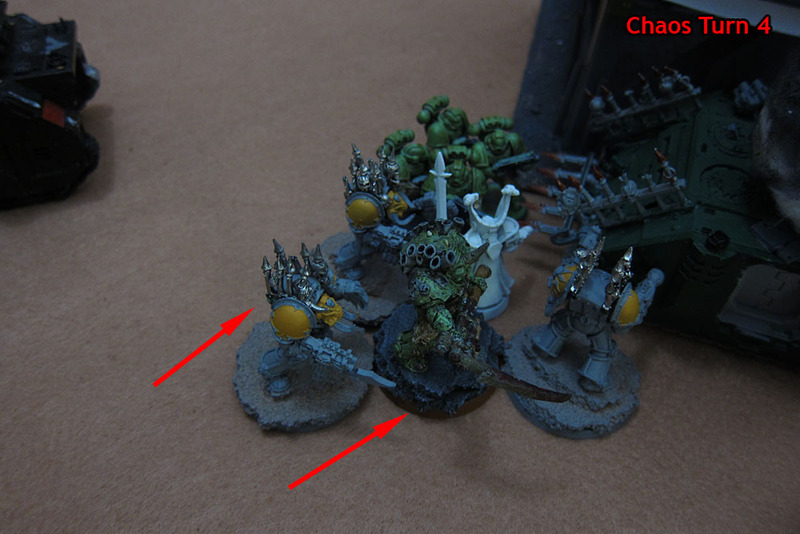 Mephiston decides to not assault the Forgefiend, and goes after the Plague Marines instead. 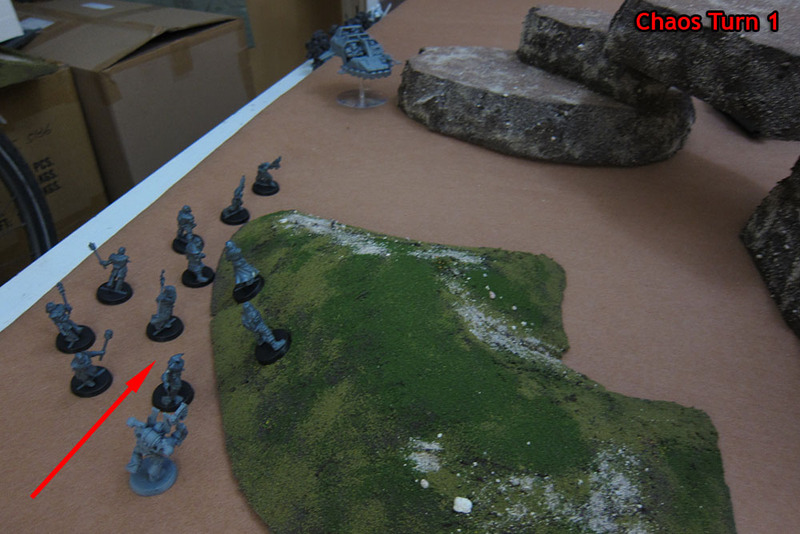 Luckily, he forgot to fire his plasma pistol! 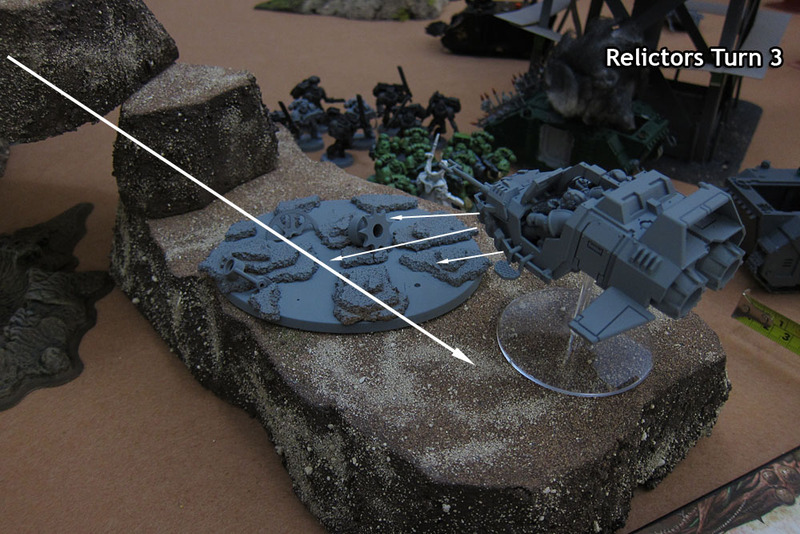 The Havocs fire on the Land Speeder with full BS and take it all the way down! 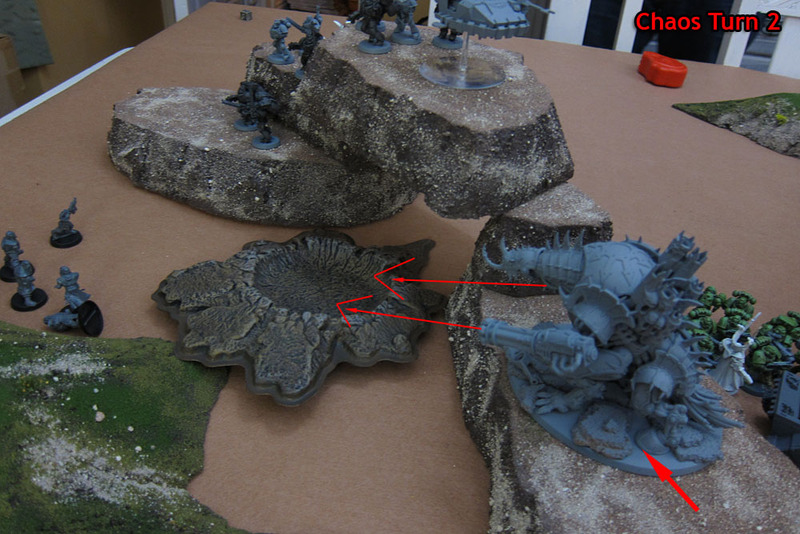 The Predator is taken out by the Forgefiend – crater time! 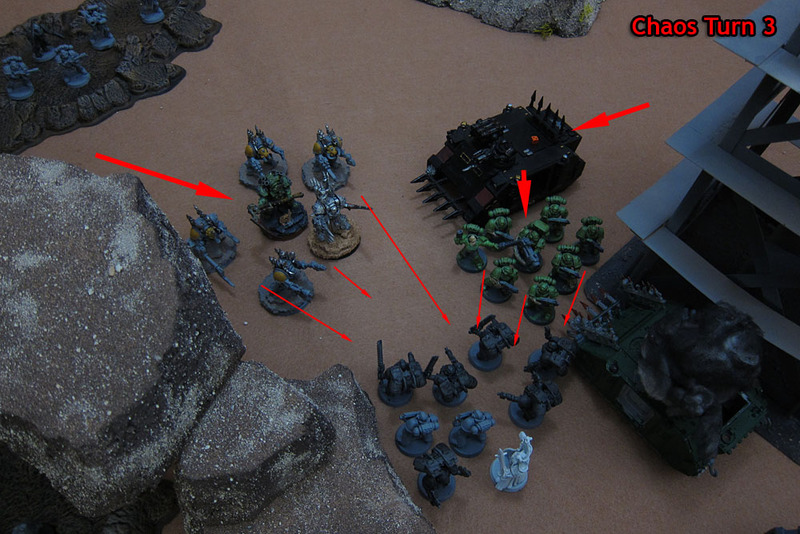 The Plague Zombies near the water tower have no weapons, so they move towards the other assault marines but fail to roll high enough to charge! 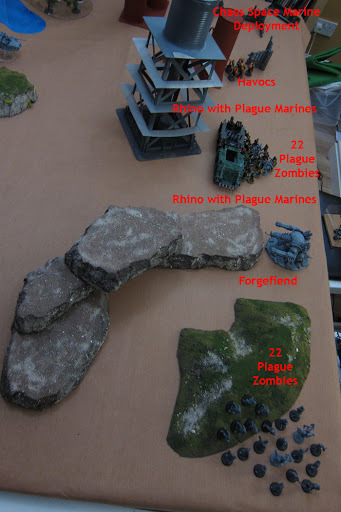 The Plague Marines pile in, but their Champion must challenge Mephiston! 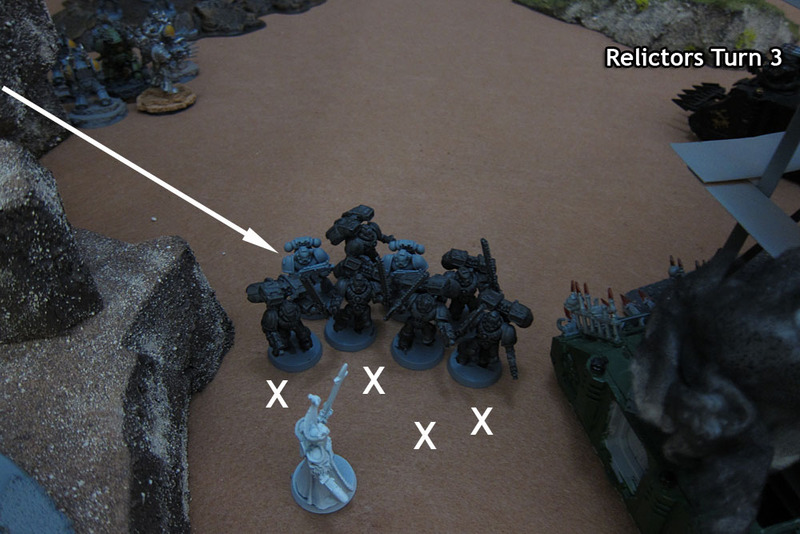 It’s not going to end well for him, but he goes for it anyway…and dies for his efforts! 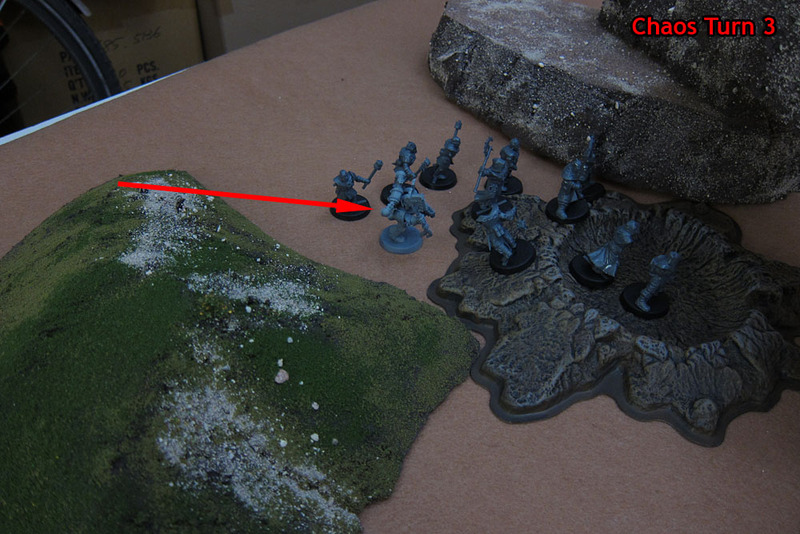 The surviving Land Speeder swoops in behind the Forgefiend and blasts away at the rear armor, exploding it! 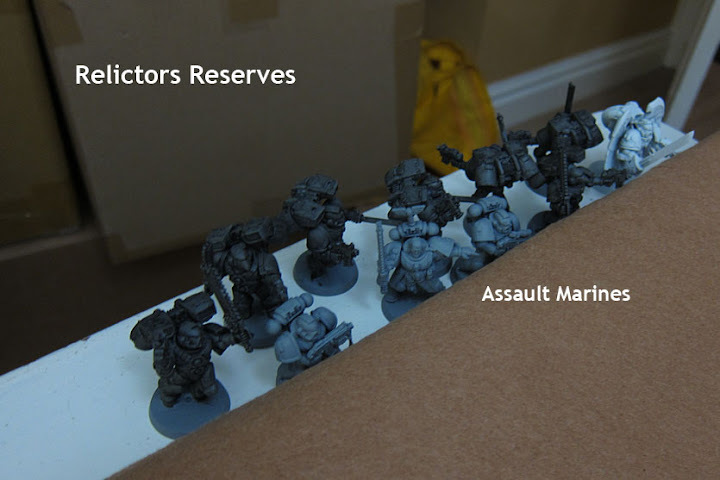 …then they assault, killing the rest! 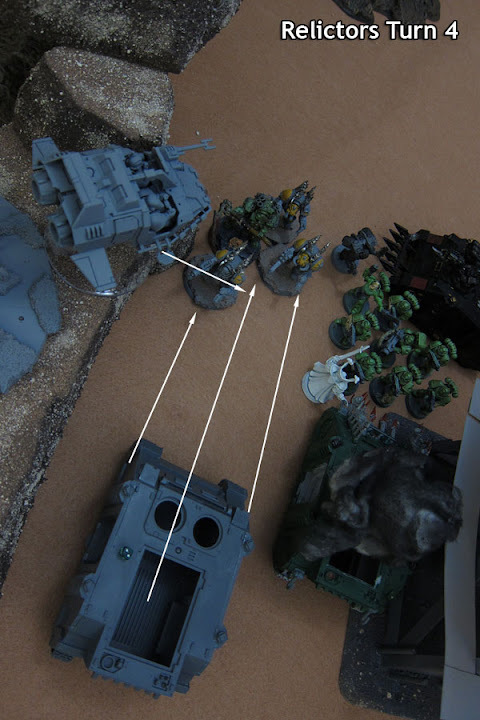 The surviving Rhino moves in, the other unit of Plague Marines disembark and they combine fire on the Assault Marines with the Terminators, taking out several! 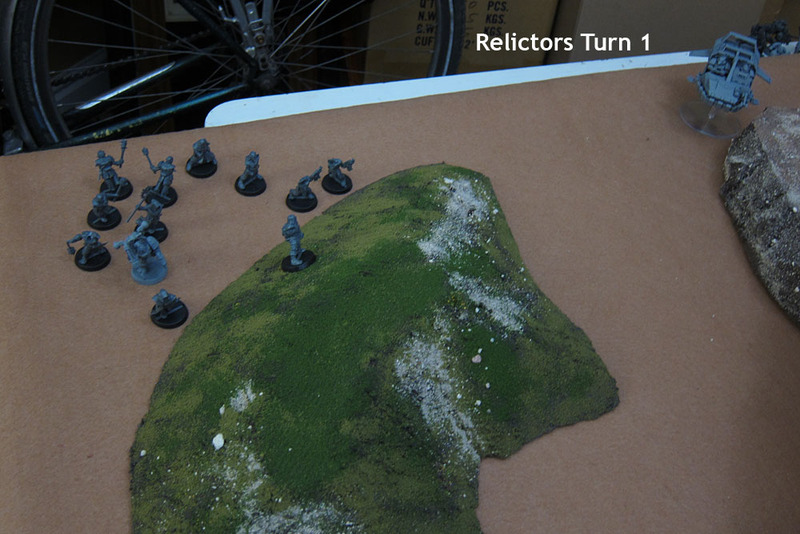 Flame template covers most of the squad! 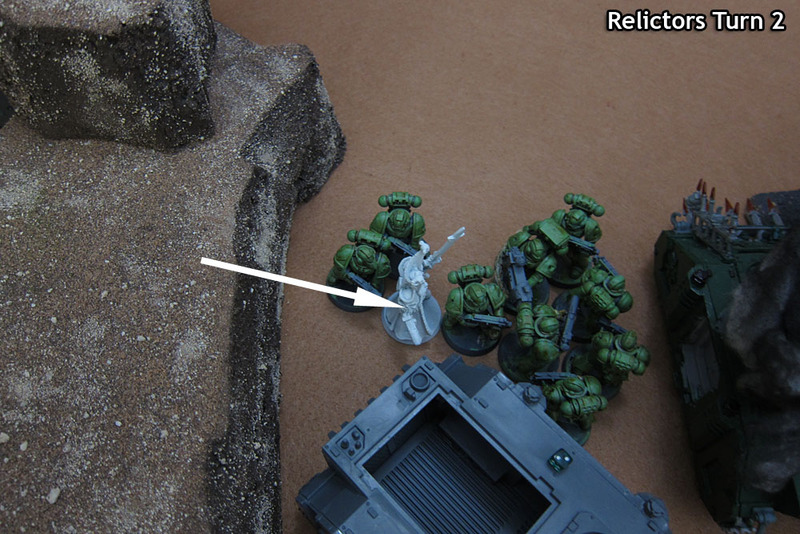 The last surviving member runs off, leaving Mephiston to stand alone! 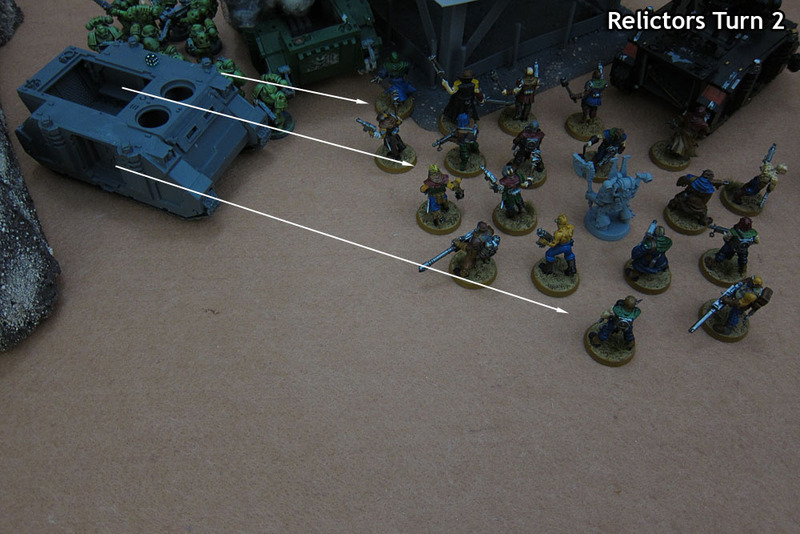 …and assault! 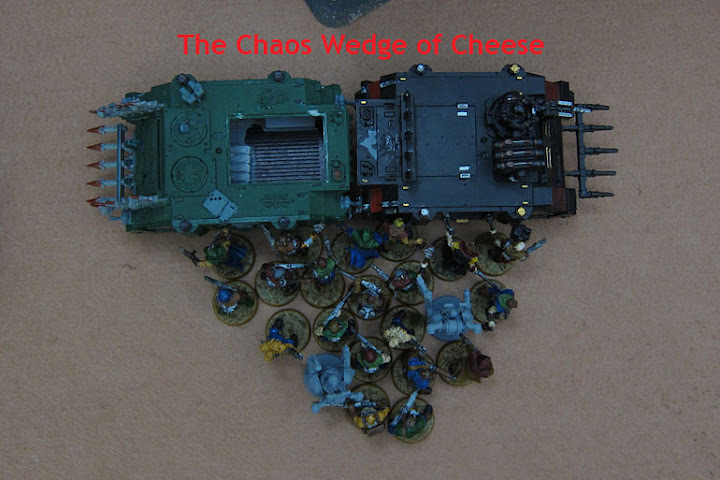 They don’t really do all that much though. 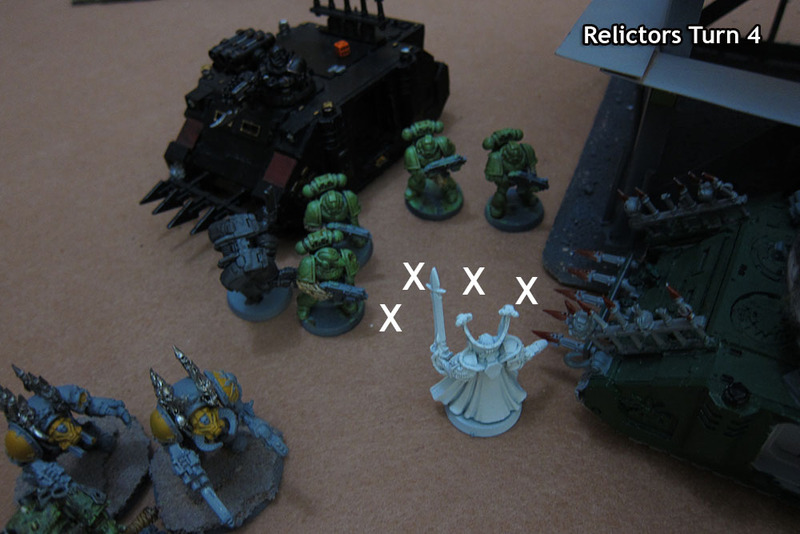 Mephiston and the last Assault Marine charge the Plague Marines, leaving the Terminators to be shot up by the Devastators – they take out the guy at the very back! 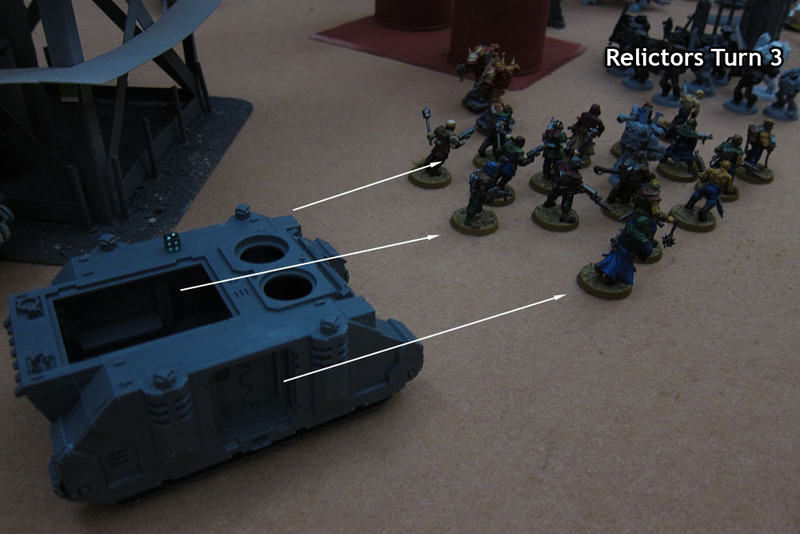 The Land Speeder and Predator also open fire on the Terminators, and their Champion goes down! 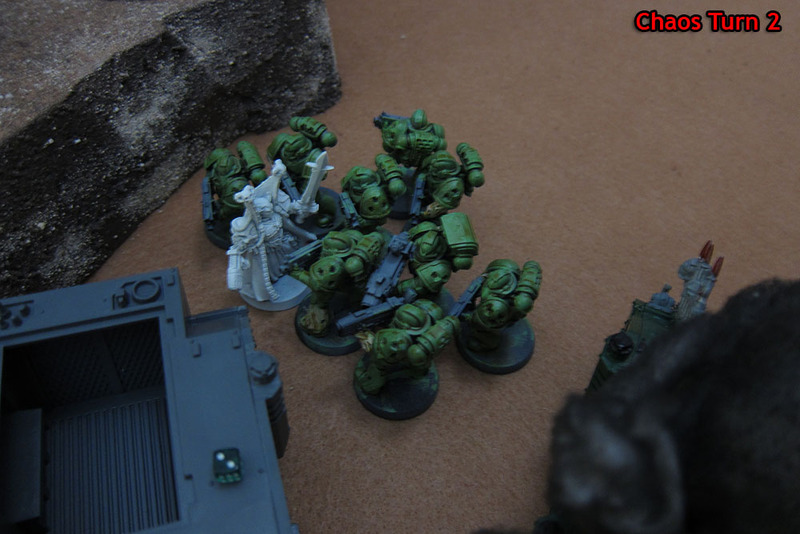 Mephiston wipes out four of the Plague Marines with his force weapon! 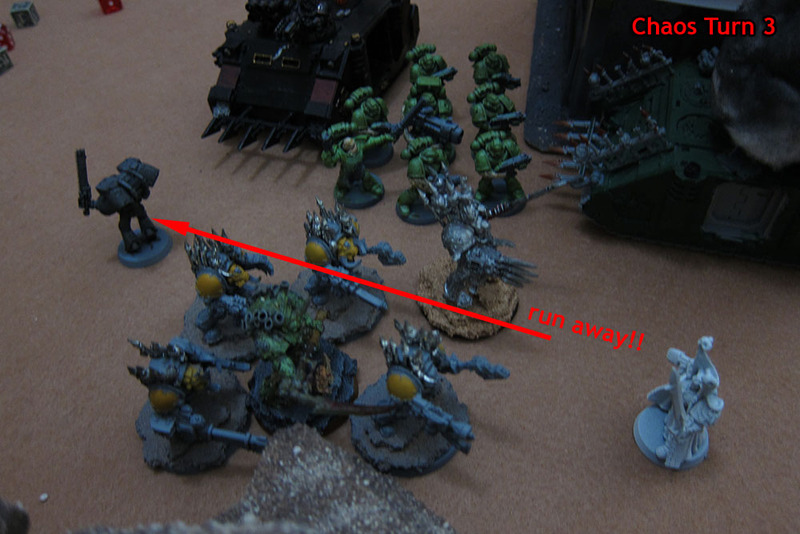 At this point we sort of lost track of what happened, apart from Typhus rolling 1 for his Daemon Weapon AGAIN! 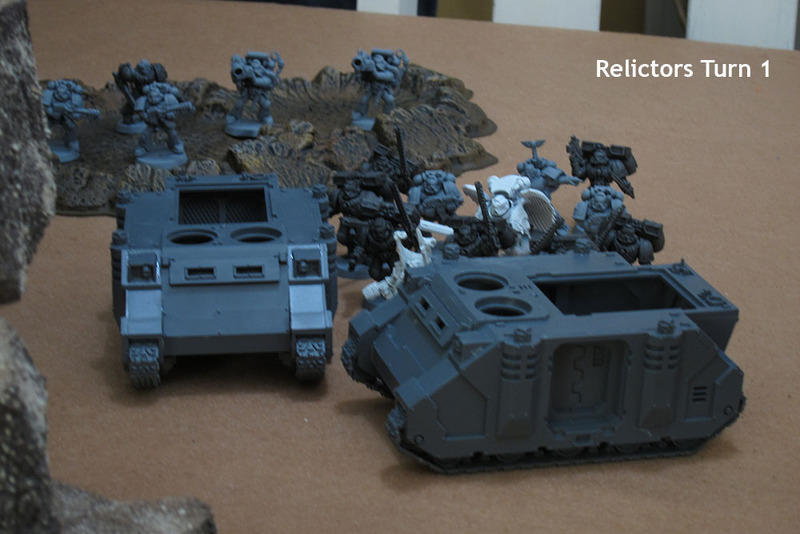 so he was only WS1 against Mephiston. 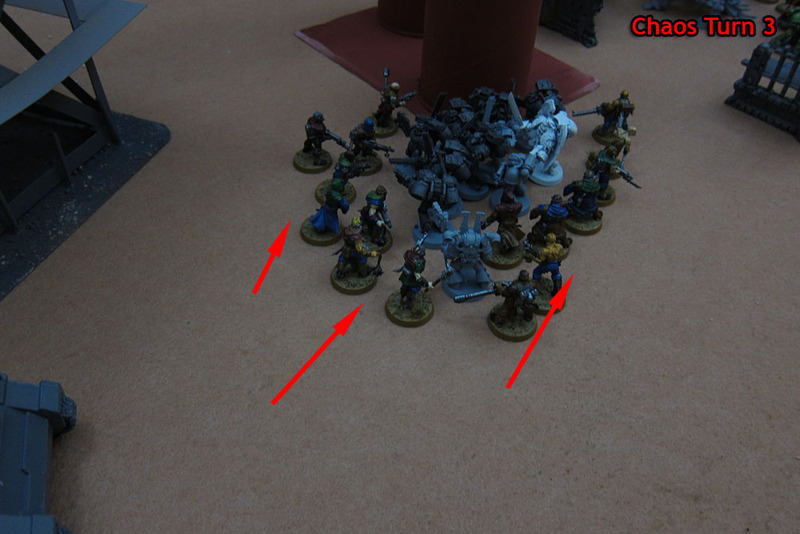 The surviving squad of Assault Marines jumped nearby, ready to assault, but the game ended on a roll after Turn 5 anyway. 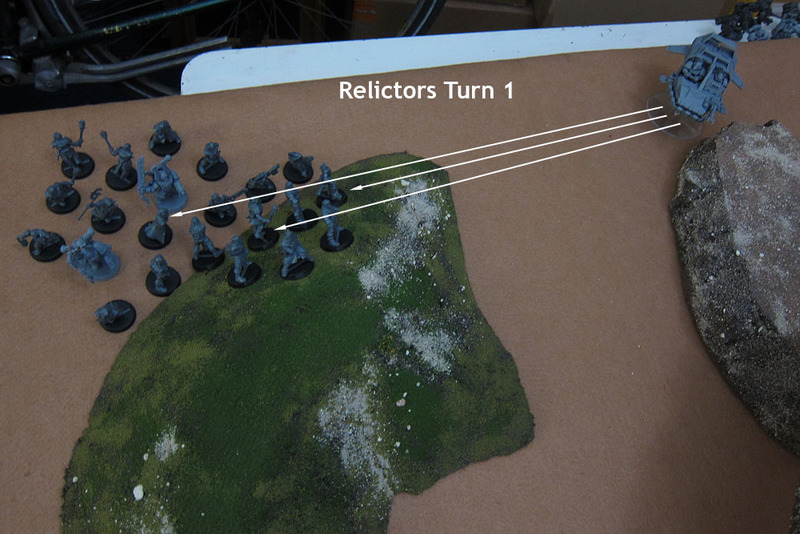 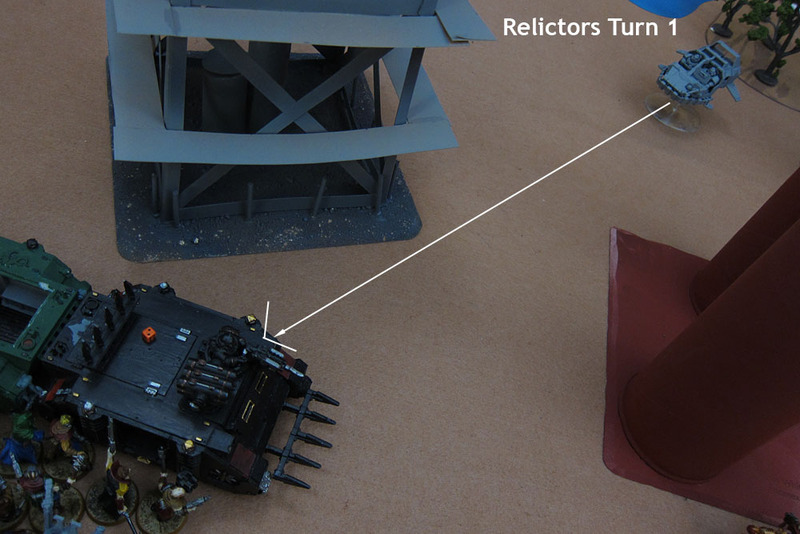 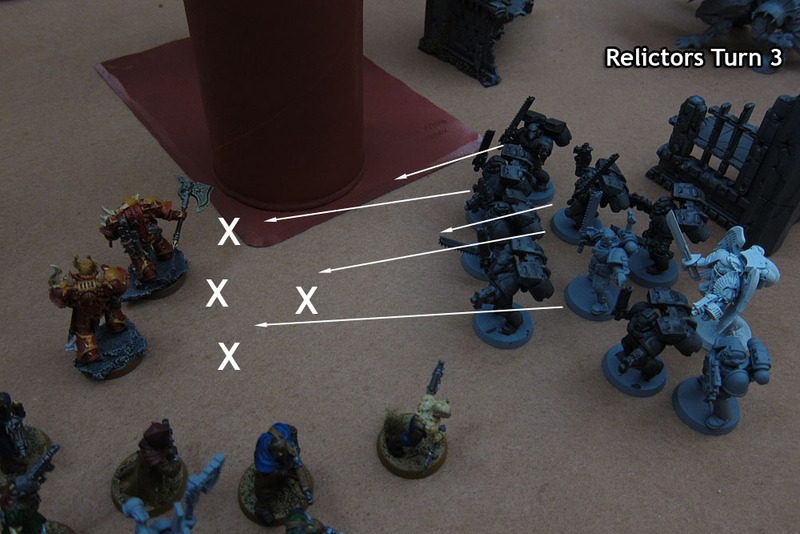 Several points for Relictors, compared to just a few for Chaos. 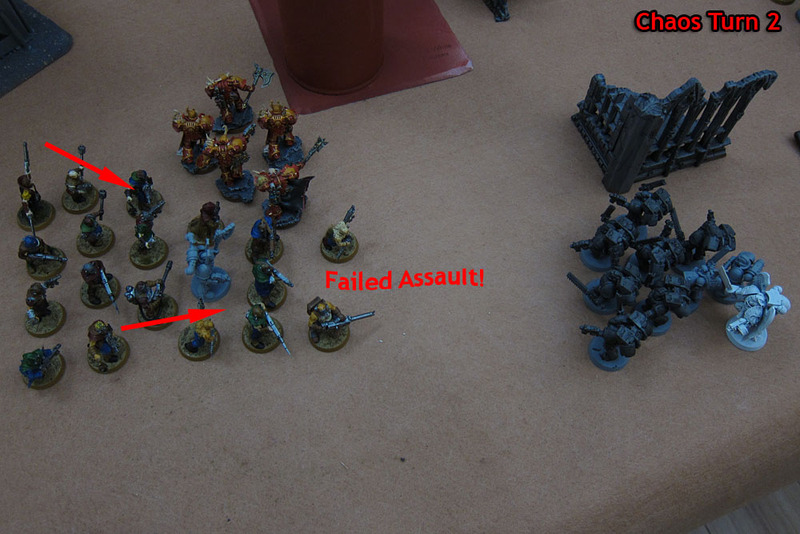 The forces of ‘good’ win this day! 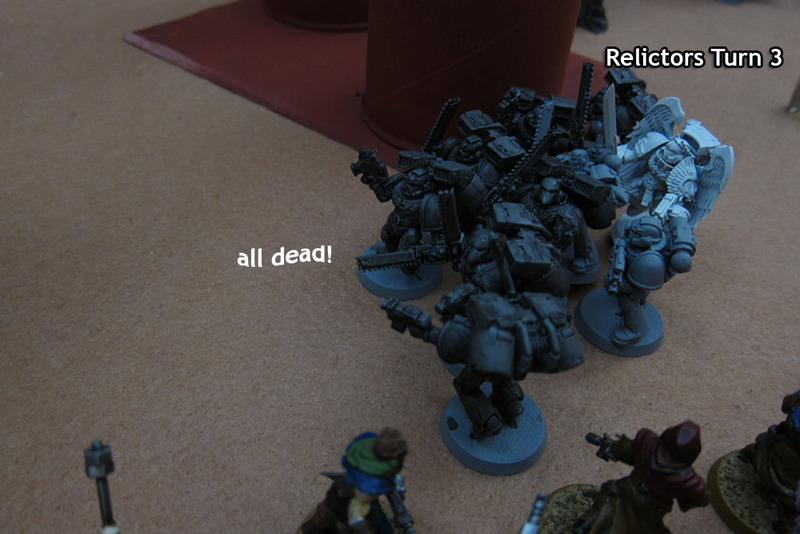 First time trying out the Cultists as Plague Zombies – even with Feel No Pain they were cut through like butter, so a bit disappointed. 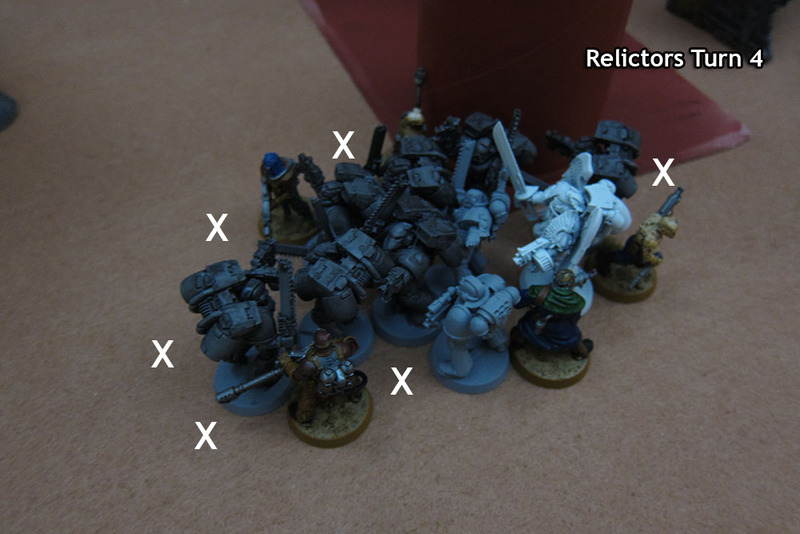 Used the Cultists to get extra scoring units but they wouldn’t hold up under pressure anyway. 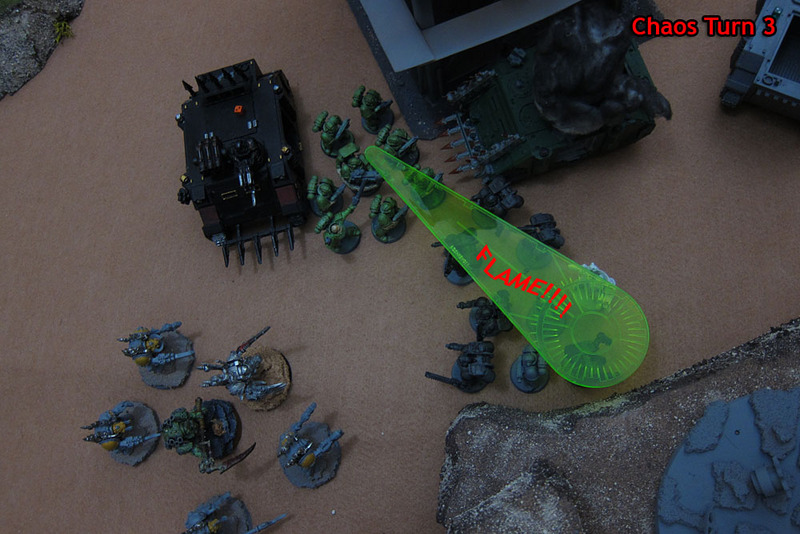 Typhus rolling 1’s on his Daemon Weapon check was a killer, I think he could have put up a much better fight against Mephiston if that hadn’t happened! 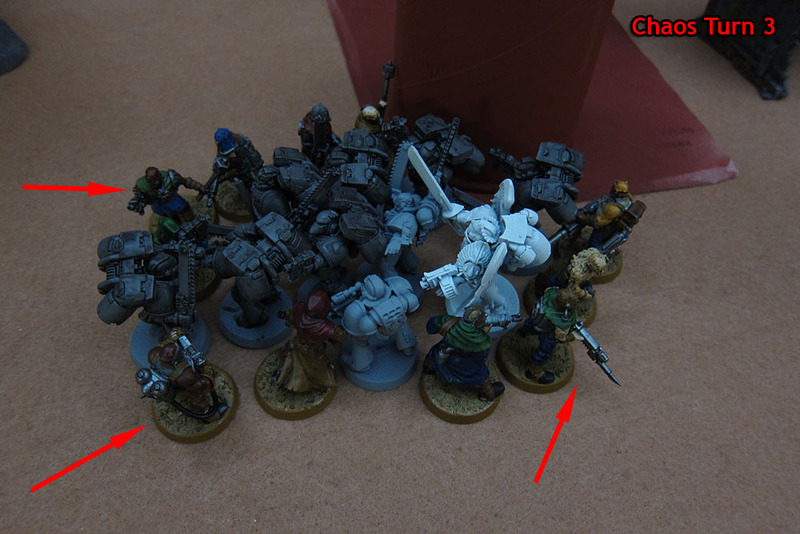 Otherwise it was OK, no major debacles. 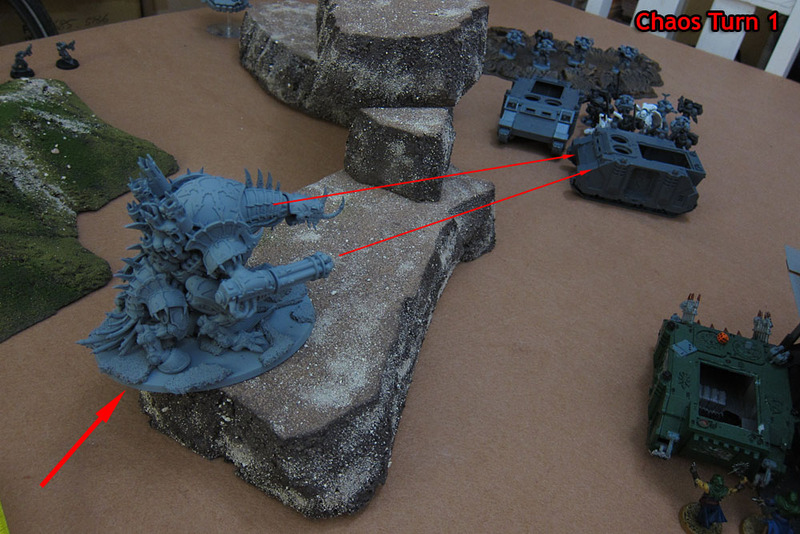 I’ll need to field more heavy stuff to take the pressure off the Forgefiend though.